Gardens are comprised of various materials and the best way to keep each area tidy is with clean lines created by landscape edging. 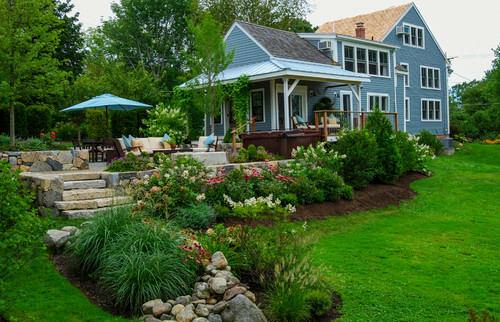 In addition to aesthetics, landscape edging serves the practical purpose of keeping gravel in place and preventing lawns from spreading. The oldest and most cost-effective technique is called trench edging. Basically, it involves making a cut in between the lawn and garden bed straight down, about 6″ deep. Make another cut at a 45 degree angle toward the garden bed and away from the lawn until it meets the first straight cut at 6″ deep. The angle prevents grass from spreading across the border and into the bed. Remove and compost the loose soil and trim the edge of the grass until it’s nice and neat. Fill the trench with the same mulch you used in the garden bed. 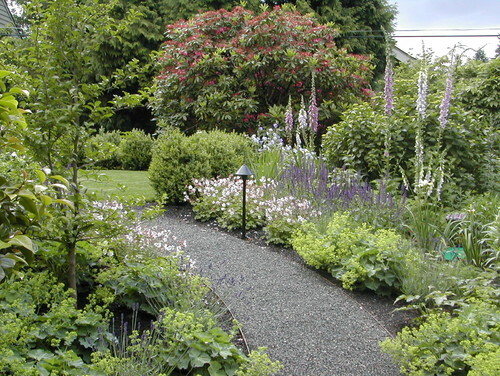 In addition to being inexpensive, this is the most natural-looking edging. However, you will have to maintain it by trimming the lawn back into a clean line as it grows or repeat the trench process. Using a curb is a very clean way to divide space in the yard. You could use poured concrete, which comes in a variety of colors, but keep in mind that poured concrete can crack as the ground shifts as well as stain. Poured concrete does open up a wide range of options as it can be poured into a variety of shapes and personalized with shells, stamps and other things pressed into it while wet. A poured concrete curb at least a foot deep into the ground is also a handy way to ward off gophers. Concrete pavers are an excellent alternative to a poured concrete curb edging. They also come in a variety of colors and styles to blend in with your home’s exterior and are easily installed in mix and match patterns. 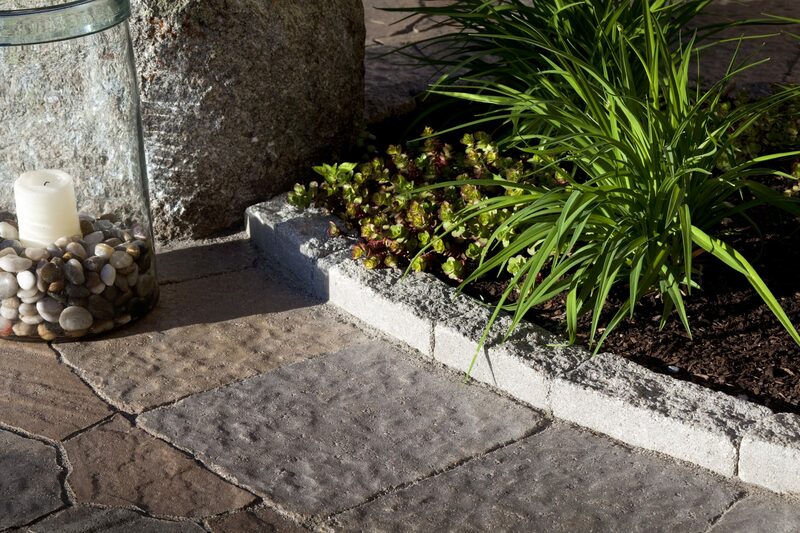 Pavers provide much more flexibility than concrete as individual pieces are easy to remove when need be. Both options are very durable and more permanent solutions that work well in a number of garden styles. All it takes is a trip to a big retailer like Home Depot to pick up bender board edging. It’s flexible and made from 100% recycled polyethylene plastic that comes in several color choices and sizes. Because it’s flexible, bender board is difficult to place in a straight line (the thinner the strip, the more easily it bends). That being said, it’s easy to cut with a saw and install without professional help. Basically, all you need to do is lay the bender board out in sunshine to loosen it up. In the meantime, dig a small trench, set the bender board in, level it and refill the trench with dirt to hold it in place. If you are creating bends, hold them in place with matching plastic stakes every 4 – 6 feet (usually sold separately). Make sure to install bender board high enough to prevent grass and other plants from simply extending their roots over the bender board. 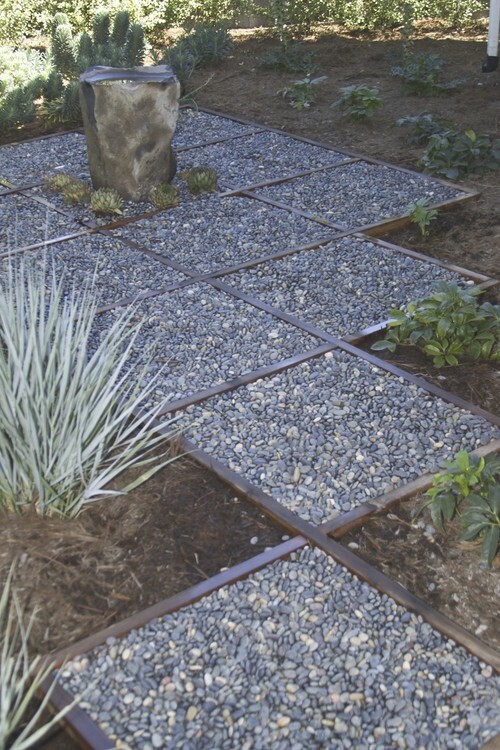 Metal edging is becoming increasingly popular as it looks fantastic in succulent gardens, in between gravel and planted areas and in front of contemporary homes. Unlike bender board, metal edging can stay in a crisp straight line with no problems. The sheen it adds lends a more modern look to a garden as well. The type of metal chosen matters. Heavy-gauge aluminum or weather-resistant steel will not rust but other choices may. Powder-coated steel can come in a variety of colors, but untreated steel may take on a rusty patina. Black metal tends to look very formal whereas green or brown does not. Thicker metal edging is more durable but also more expensive and note that any metal over a long period of time may start to fray in the elements. Metal edging is easy and can be fairly inexpensive to buy at home improvement stores. If your soil is soft, digging a trench to put it in place may be totally unnecessary. To install, simply place a 2×4 plank along the top edge of the metal and hammer the wood to drive the metal bender board into the ground. Installation can be an easy DIY project. 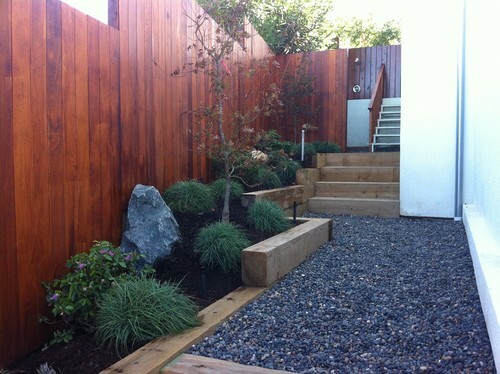 Adding wood edging creates an organic, rustic feel to the yard. It could be something as big and bold as railroad ties or simply a 2×4″ plank. Keep in mind that untreated wood will rot from moisture in a garden application rather quickly. Treated wood will last a big longer but is also subject to decay and will need eventual replacing. Wood can also change color over time. If you’re going to use a wood edging near a vegetable garden, it’s best to use untreated wood to avoid chemicals leaching into the soil. Also, if garden edges have curves in them, wood might be difficult to use as it’s almost always cut in straight planks. 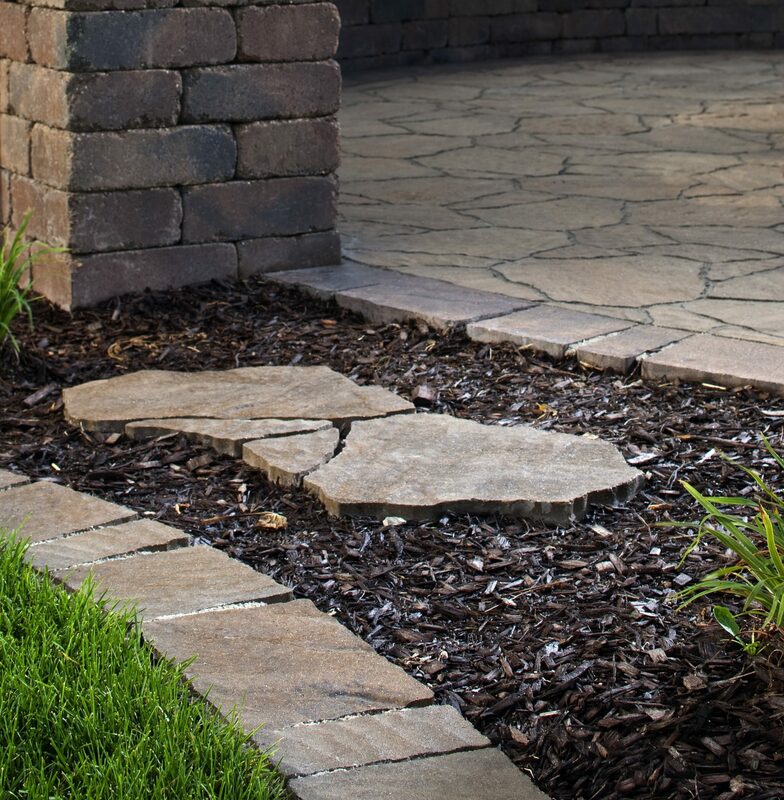 By far, the most natural-looking way to incorporate rocks and boulders as edging is to use stones native to your area and bury them a few inches deep to make it look like they’ve been in place for a while. Gaps between boulders and rocks can actually be good for drainage. If a line of distinction or boundary is your goal, make sure that the rocks and boulders are of a similar size to create continuity. Make sure that nearby ground cover won’t grow over the rocks so that the entire line is visible. It doesn’t require much skill to install brick edging. And, bricks come in crisp red color when new while salvaged brick lends a more rustic, faded appearance. Lichen and moss like to grow on brick which is a desired look for many. It’s not necessary to mortar brick in place when laying it flat. Each piece can be set on sand and placed side-by-side. 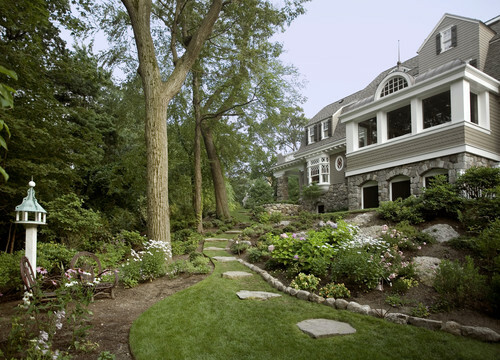 What kind of garden edging do you prefer?